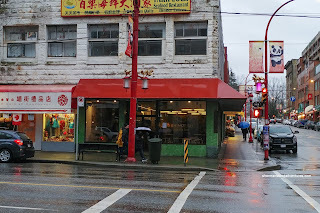 When Rhinofish Noodle Bar first opened in Chinatown a year and a half ago, I was invited to try the place out. Well, I never did make it out there due to my busy schedule. Now with that being said, there was another reason I wasn't super-motivated to head out there as well. Based on the comments of some fellow foodie-friends, the place had some work to do still. Although there was some positive elements, there was equal concerns over the beef broth in the Taiwanese Beef Noodle. So I just didn't end up going until recently (more than one visit). 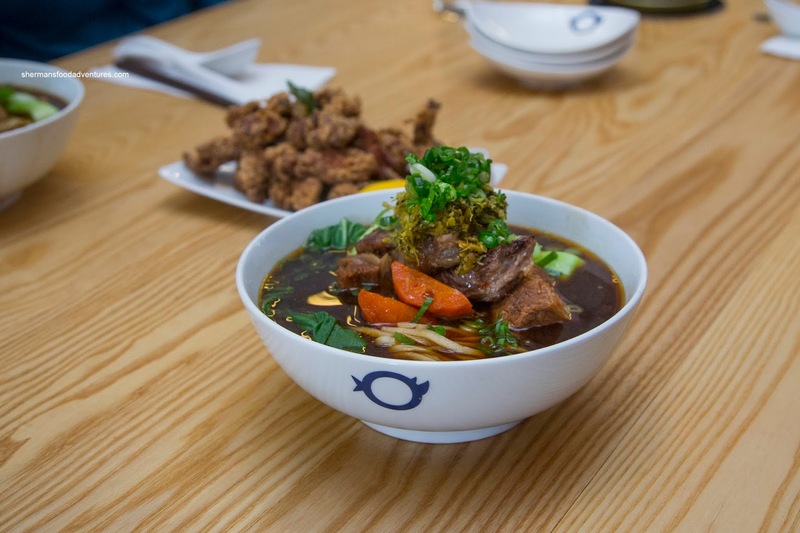 Of course, the aforementioned Taiwanese Beef Noodle was at the forefront. So much so, we ordered 3 bowls. 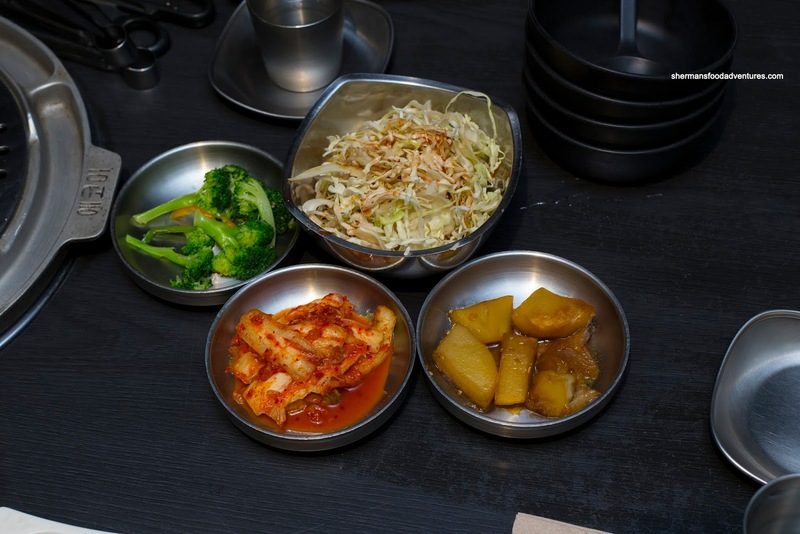 Upon hitting the table, we liked how it was plated where the ample amount of pickled mustard greens were piled high. 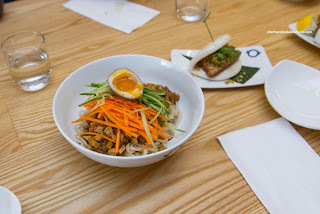 The individual components of the bowl were actually very good. We found the noodles to be perfectly al dente with a rebound that resulted in an appealing chew. Ample in portion, the beef was tender and gelatinous where the light seared added a nice bark that resulted in an extra layer of texture. Onto the soup, it was definitely different than most of the other versions in town. There seem to be a wine essence and finish which was pretty pronounced. The meatiness and salt content of the soup was acceptable but definitely could've been more strong. For myself, I went for the Zhang Ji Mein that was topped with a plethora of finely julienned carrot and cucumber. There was also more than enough meat sauce with pressed tofu. Although there was a noticeable garlickiness and slight spice, the meat sauce needed more punch. Possibly a bit more chilis and more salt. However, that was easily rectified by the side of hot sauce. As with the previous noodles, these were perfectly al dente. For our sides, we tried their Chicken Nuggets with nanjing sauce. At first glance, they appeared to be dry and over-fried. However, that was not the case at all. The crunchy exterior gave way to truly succulent and juicy dark meat. Each nugget was spiced enough that we could taste the five-spice without it being too licorice-focused. On the side, the dip was lightly tangy and sweet. 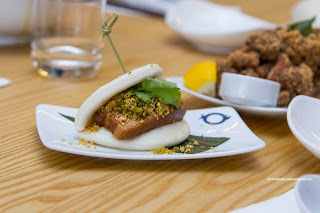 We also ordered a couple of the Bao stuffed with pork belly, mustard greens and ground peanut. This was classic Taiwanese and ate really well. The bao was soft while the pork belly was just fatty enough where it nearly melted in our mouths while retaining a meatiness. There was a nice balance of ingredients where the combination of sweet, savoury and tangy was on point. Overall, the food was actually decent. However, the TBN could've had more depth and impact. Lost within all the hype of Popeye's Louisiana Kitchen opening up in PoCo is that this is not its first foray into the Lower Mainland. There once was a location in Coquitlam's Pinetree Village which closed in 2006. There may have been many reasons why the place didn't survive, but I remember it being one of my favourites (as I lived nearby). Sadly, I didn't get another taste of Popeye's until 2013 when I was down in Orlando. 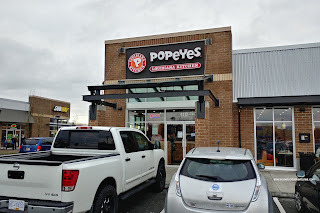 Well, as mentioned, I don't have to wait until another visit to the States as Popeye's has opened up shop in PoCo's Fremont Village. We headed out there for a taste during the holidays and let's just say everyone else had the same idea. 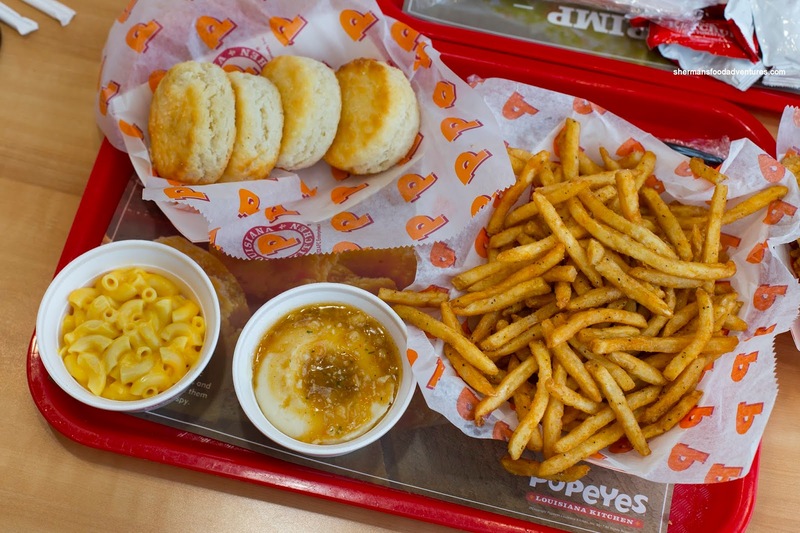 We decided to share the 8-Piece Bonafide Meal consisting of chicken, 4 biscuits and one large side. I went for half mild and half spicy. Basically, this was a whole chicken with 2 wings, 2 drumsticks, 2 thighs and 2 breasts. 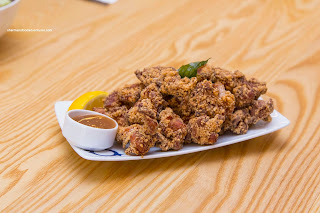 For me I enjoyed the spicy more due to the layers of heat and spices combined with the crunchy rendered skin. Naturally, the dark meat was juicy, but the white meat was equally moist and tender. I actually preferred that more, especially dunked into the hot sauce. We got the Cajun Fries as our large side and they were very crunchy and slightly spicy (probably too crunchy though). I added a small Mac n' Cheese and it was very buttery with overly soft pasta. As part of my daughter's meal (yes, she had her own), she had the small Mashed Potatoes with Cajun gravy. I would say the gravy was more spiced than spicy. Good though. 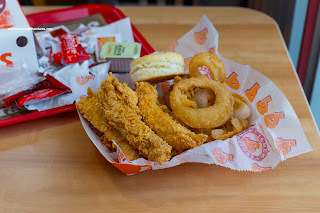 So my daughter was too good for our fried chicken and had the mild Chicken Tenders Platter with Onion Rings and the aforementioned mashed potatoes. Honestly, I thought the tenders were only okay because they weren't as juicy as the fried chicken. However, the batter was crunchy and they weren't greasy. They were very tasty when dunked into the amped blackened ranch dressing. We weren't impressed with the onion rings as they were soggy and not crunchy. Despite this, the fried chicken is as good as I remembered and can be a legit contender in the Lower Mainland. 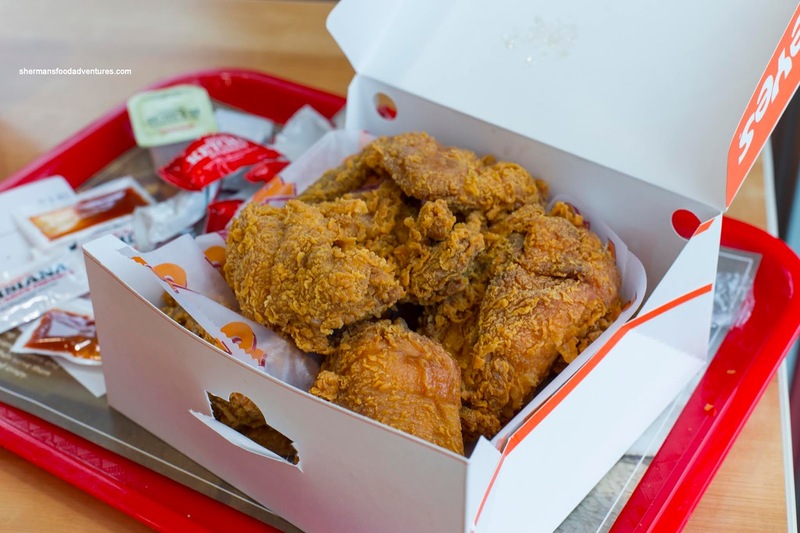 Think of it as a cross between LA Chicken and Church's, but I would still give them the edge over Popeye's at the moment. 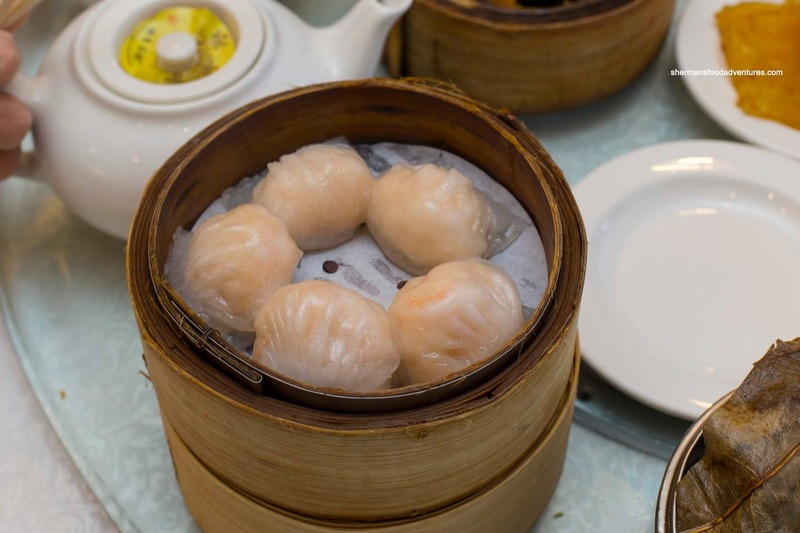 As much as we have a multitude of choices when it comes to Dim Sum in the Lower Mainland, they are generally the same ones over and over again. Most of us have our standbys and rarely venture beyond them. Furthermore, not everyone lives in Richmond, so the trek out there and subsequent driving obstacle course may not be practical. 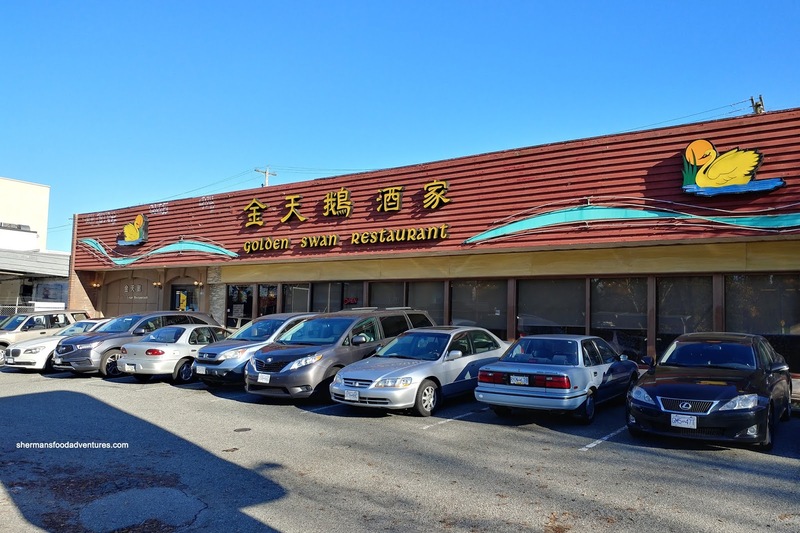 Interestingly, we rarely see new Chinese restaurants popping up with Dim Sum service. That also encourages us to stay with the existing ones. 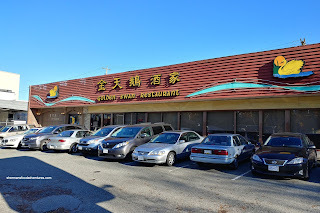 Hence, when Guy Smiley wanted to meet up for Dim Sum, we went to the good ol' Golden Swan. One of the last places left with push carts, it is pretty easy to get all of your food quickly. That we did with everything hitting the table at once. 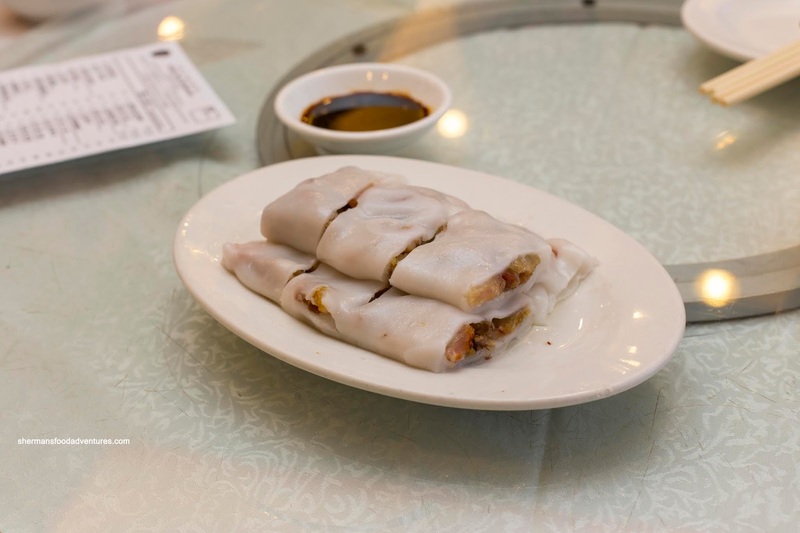 We started with the BBQ Pork Rice Noodle Roll. Now we usually get the shrimp, but they didn't have any. Although one could technically order it, this is one of the negatives of push carts as you are privy to only what is available. Or you can do the Hong Kong thing and run up to each cart and hog all the food... Anyways, the noodle roll was good though as it was stuffed with a bevy of lean BBQ pork. I found the rice noodle to be soft and thin with an appealing elasticity. 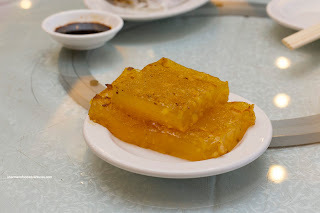 For no good reason, my Mother-in-Law ordered the Osmanthus Jelly right off the bat. First of all, we didn't need dessert at that moment. Second of all, she is diabetic... Nothing she does makes sense! Well, it was good though with a light sear being semi-sweet and not overly dense. 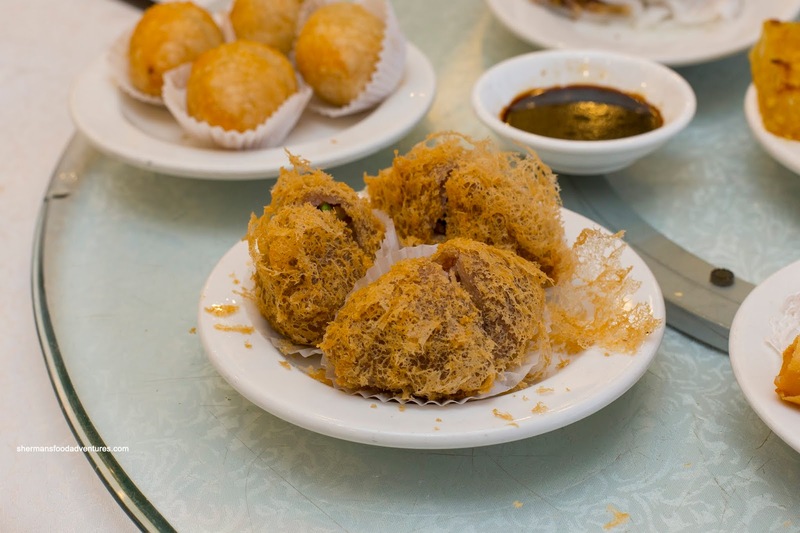 Since the deep fried cart was the next to arrive, we got everything off of it including the Deep Fried Taro Dumplings and its cousin, the Deep Fried Glutinous Dumpling. One common thing among them, that I personally dislike, was the addition of both cilantro and green onion. I'm okay with the green onion as it adds flavour, but the cilantro is just too strong for both items. With that being said, I thought the taro dumpling was good nevertheless. 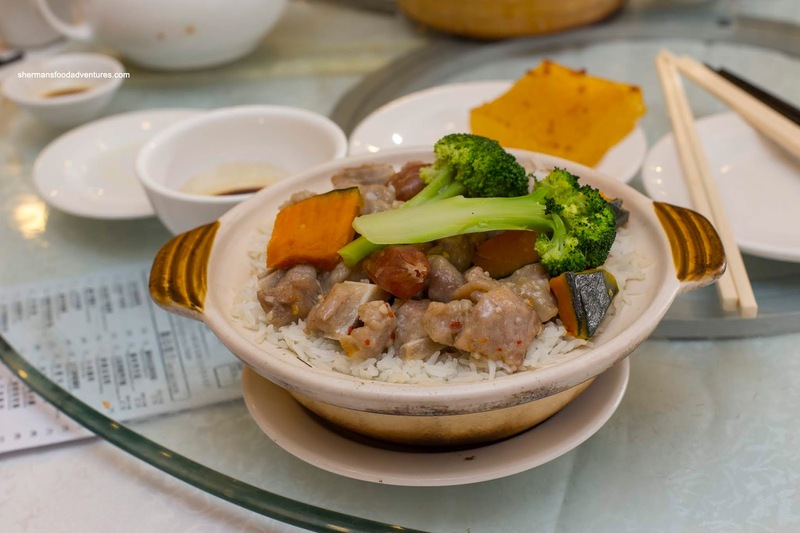 There was a fluffy taro exterior surrounding tender morsels of pork. 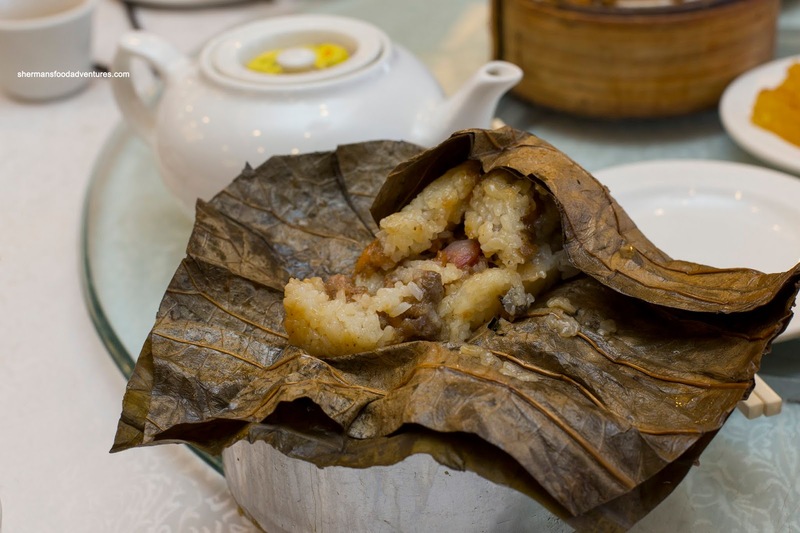 As for the glutinous dumpling, the layer of mashed sticky rice was a little thick, but not dense. Both were a touch greasy, but not to the point where it wasn't appealing. Back to the negatives of push carts, these were not cold, but hardly hot either. Also from the same cart, we got the Deep Fried Shrimp Spring Rolls. It came with a plate of 4 smaller rolls. As such, they were wrapped more tightly and had more layers. This meant the roll itself had a considerably more firmer crunch. 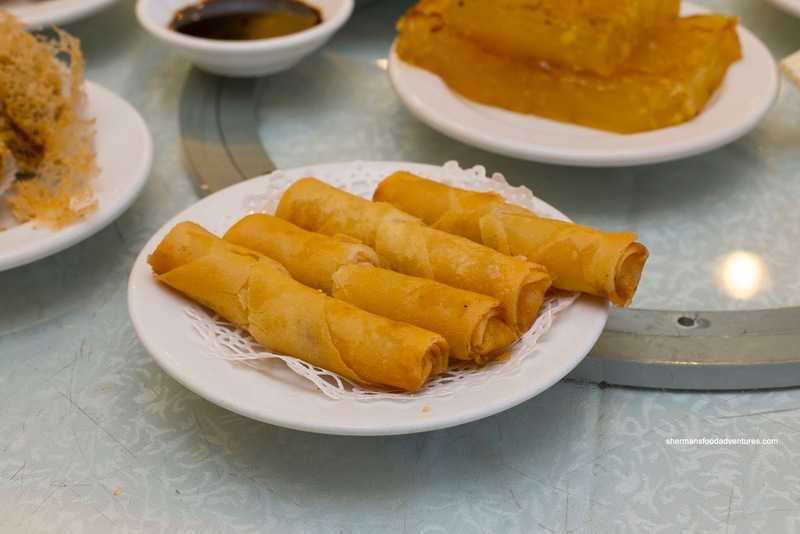 This is completely subjective, but I personally prefer a bigger spring roll with more shrimp filling and a lighter crunch. Despite this, the spring roll was still good and the shrimp inside was buttery and meaty. 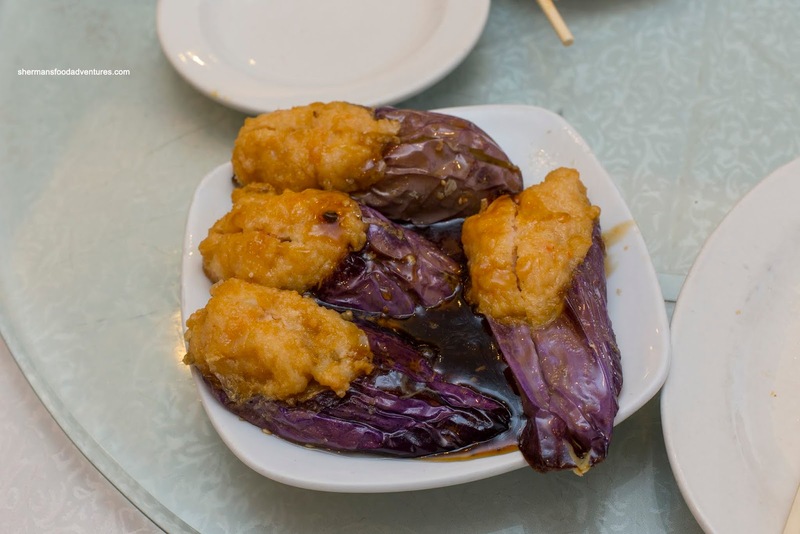 Due to the fact we probably caught the cart early, the Fried Eggplant stuffed with shrimp mousse was served hot. The eggplant itself was tender while not too mushy. It had a crispy exterior and was blessed with a good amount of buttery and bouncy shrimp mousse. Luckily it had enough inherent seasoning as the black bean sauce was pretty bland. 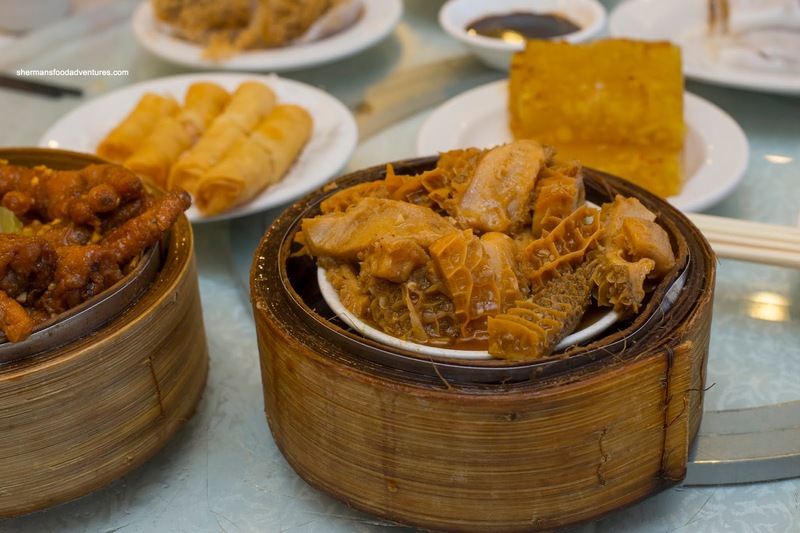 Onto some steamed items, we had the Beef Meatballs and the Bean Curd Skin Roll. Although a bit small in size and pale in appearance, the beef meatballs were pretty textbook. Beyond the initial bounce and resistance, the meatball was soft while retaining some meatiness. There was a balanced amount of greens and the seasoning was mild. Great for dunking into the side of Worcestershire sauce. 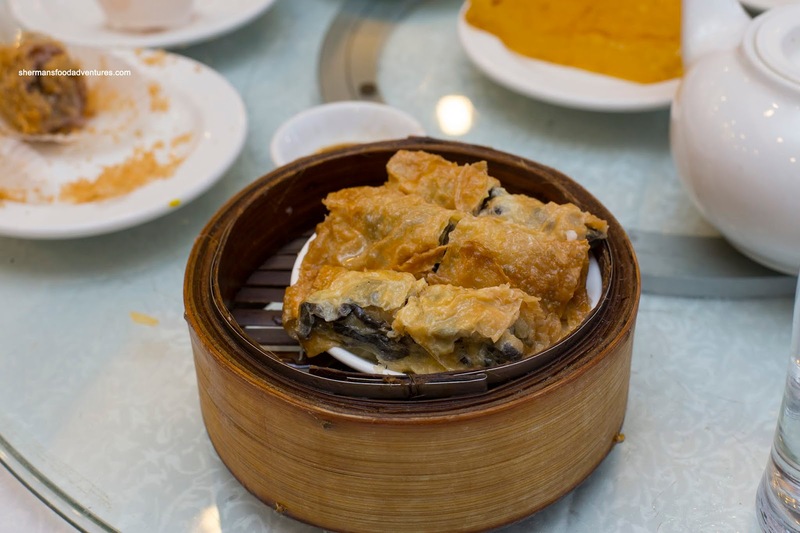 Usually, the bean curd skin roll is doused in an obscene amount of watered-down and thickened oyster sauce. This was lacking that and as such, ate rather dry. Inside, the filling was dominated by wood-ear mushroom which gave a nice crunch. There was only a smattering of tender pork which was a bit fatty. 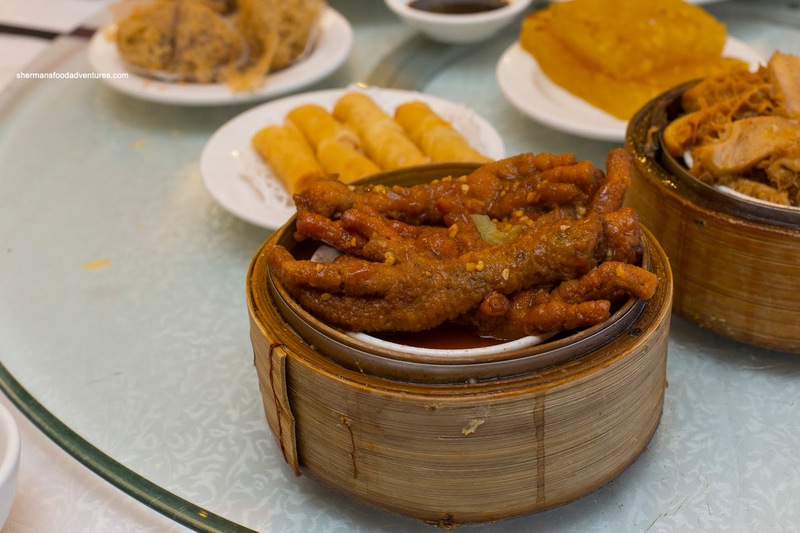 My favourite items were next in the Steamed Honeycomb Beef Tripe and the Phoenix Talons (Chicken Feet). Presented as a fairly large portion, the beef tripe was not bad. I thought the texture was on point riding the fine line between soft and chewy. There was a good amount of garlickiness mixed with a touch of spice and sweetness. There was a tinge of gaminess that I didn't mind, but for some, could be a turn-off. As for the chicken feet, they were equally bathed in a sweet, garlicky and slightly spicy sauce. I though they were cooked enough so that the cartilage and fat underneath were soft while not melted away. The skin itself was tender and plump. For some odd reason, the lady with the Ha Gau (Shrimp Dumplings) on her cart nearly whizzed right past us if we hadn't stopped her. There was no Siu Mai, so we didn't end up ordering it because it would've been a 15 to 20 minute wait. Served as a steamer of 5 dumplings, they were a bit smaller, but great for sharing. The dumpling skin was chewy and on point. 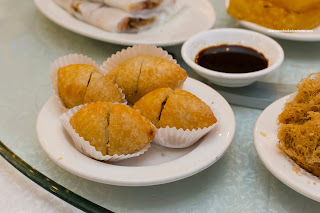 Inside, the whole shrimp filling was buttery and moist with a sweet snap. This was a solid rendition of this classic Dim Sum dish. For the kiddies, we got the obligatory Lo Mei Gai (Sticky Rice). Again, this was textbook with soft chewy glutinous rice that was not too wet. There was a balanced amount of ground pork filling that was mildly seasoned. To carb up even more, we ordered the Pork Spareribs on Rice served in a clay pot. This was a special order and took about 25 minutes to arrive. Loved the plethora of tender spareribs on top as they maintained a meatiness while having that classic bounce. There was a bit of spice to go with the ample garlickiness. Unfortunately, the rice underneath was pretty mushy and wet. This was exacerbated by adding the sweetened soy to it. Yet another form of carb, we had the Preserved Egg and Salted Pork Congee. 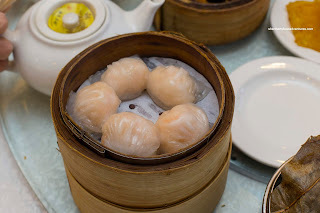 Normally, I find the Dim Sum version of this usually watered-down and lacking in ingredients (especially from a push cart). However, this was full of egg and pork. Hence, it ate robust and was full of flavour. Furthermore, it was fairly thick and consistent throughout. 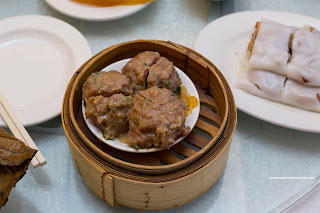 So despite so inconsistencies, the Dim Sum at Golden Swan is still pretty solid. If you like push carts, this is is a place to reminisce, but prepare to wait for your favourites. To be brutally honest, I've been actually turned off by the rush of poke spots opening all over the Lower Mainland. There have been so many in seemingly random locations, I haven't and don't want to keep track. Besides, most are not really poke at all. 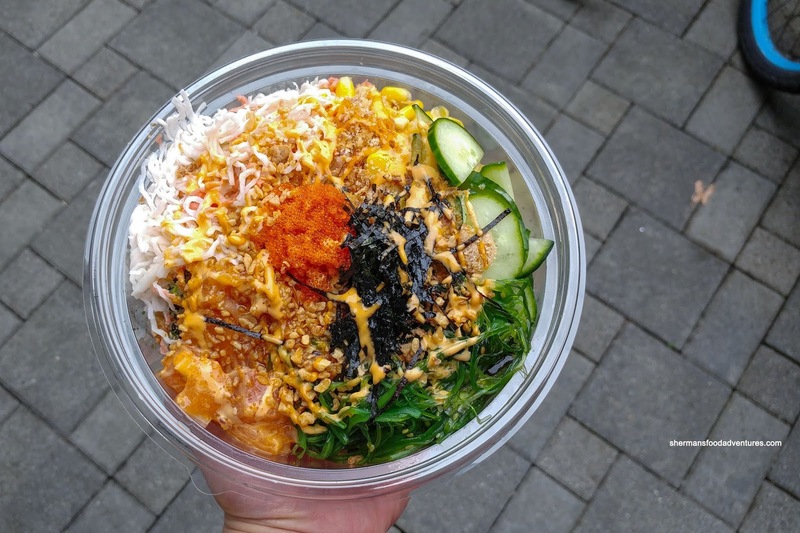 In Hawaii, poke is a simple concoction of fish, sliced onion, soy, sesame oil and a few other ingredients here and there. 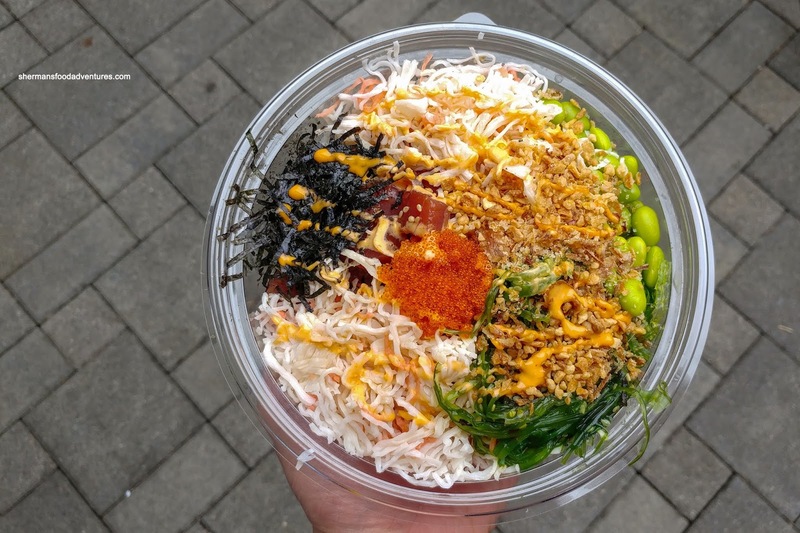 What we have in Vancouver and most of the mainland USA is a poke salad for lack of a better description. I have no problem with that honestly because restaurants have to adapt to the local tastes in order to appeal to the most amount of customers. Personally, I just don't have a keen interest in that, but I will eat it if the opportunity presents itself. So with a Groupon in hand, I visited Steve's Poke Bar (which incidentally boasts authentic poke). I ended up getting 3 customized bowls for the fam with regular sushi rice underneath. The rice was rather warm, so transporting the cold fish on top with the lid covered did result in some temperature changes. I recommend eating this on-site or at the very least as soon as possible. 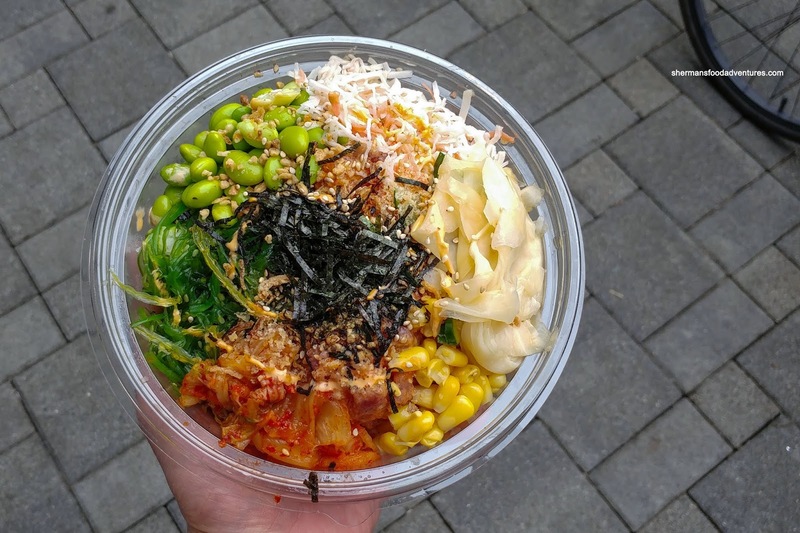 Other than being authentic, one more thing sets Steve's apart from most of the other poke spots in town. They provided all the sauces and condiments for one to customize for themselves. For me, that is a real plus since you can really make it your own and if you wanted to add more flavour later, you can just walk on back up and add more (assuming you are eating in). I found the fish quality at Steve's to be very good with a natural sweetness and essence that was fresh-tasting. Textures were on point with buttery salmon with a bite and equally buttery tuna that was tender, yet not mushy. I thought the spicy versions were balanced and provided enough spice for impact without overwhelming the delicate ingredients. Mind you, one could make it spicier with the sauces provided. 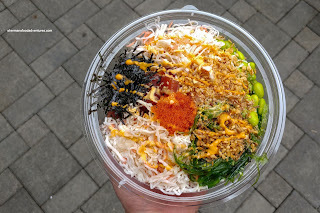 With Steve's, one can technically have an authentic poke bowl (can also do that at other places as well) by just keeping it simple. But if you must have a salad or more variety, they do have a variety of toppings as well. As you can see, I did add a decent amount of toppings (as I've said, I don't mind this), however, you can do the authentic way too. 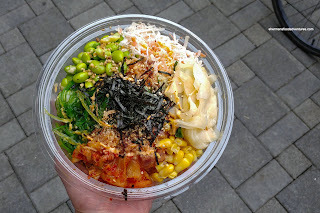 I rather enjoyed Steve's Poke Bar and will definitely go back. 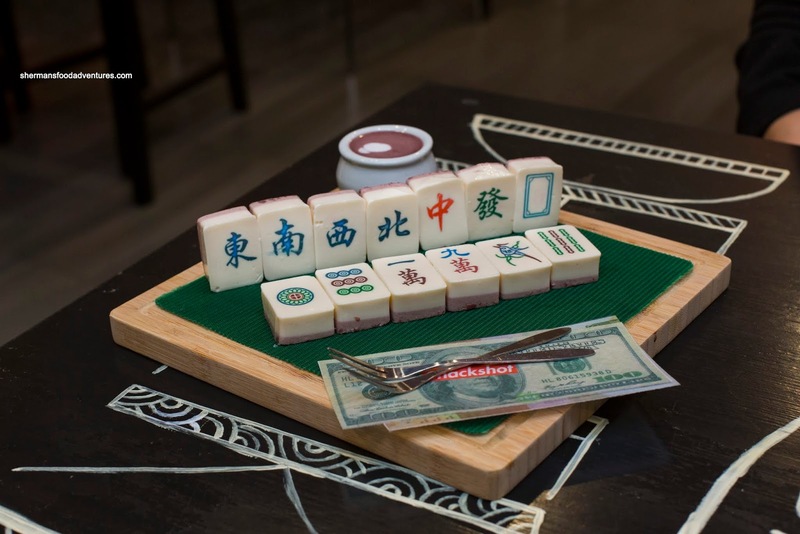 Okay, I'm sure you've seen it - mahjong tiles accompanied by money served on a platter. Served on a platter? Huh? You see, it is a whimsical play on dessert with coconut and red bean pudding combined posing as mahjong tiles. 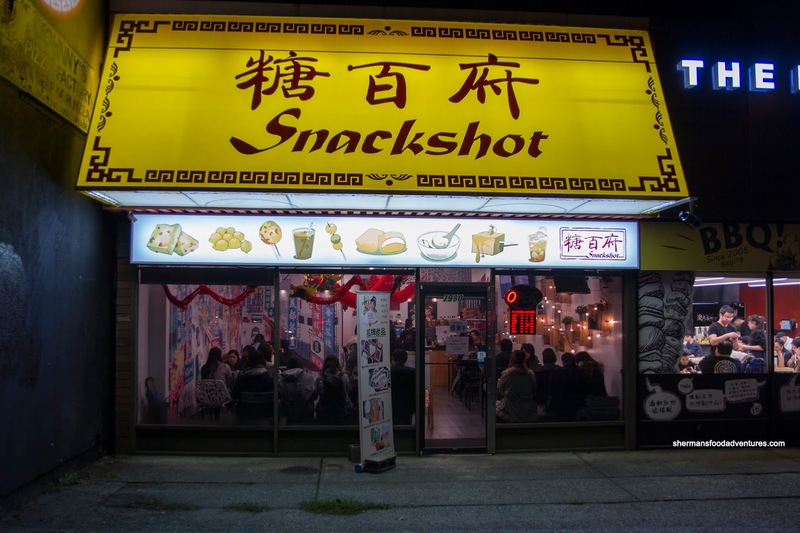 This dessert is found at Snackshot on Granville Street. At first glance, it looks like the real deal, but alas, you are supposed to eat it. I dismissed this as a gimmick and never actually gave another thought to try it. Finally, I relented because we couldn't think of any other place to go for dessert. The reason for this is we have either tried most of the other spots and/or there aren't enough dessert spots in town! Okay, let's just get right to it. The menu stated there is a limit of 15 of the Mahjong Dessert and we were able to snag it. Possibly one of the most whimsical dessert presentations in town with coconut/red bean pudding doubling as mahjong tiles and edible rice paper money. 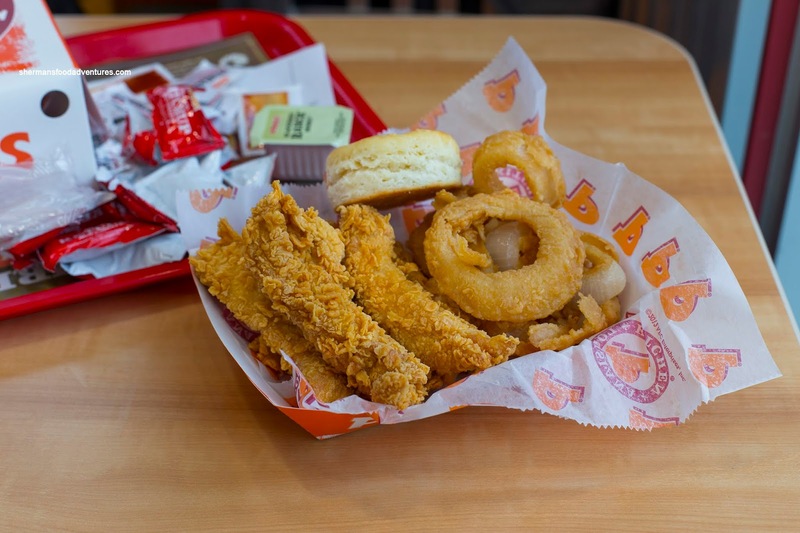 At first glance, the whole platter is a dead ringer for the real thing. Looks are one thing, but how about the execution? Well, I'm glad to report that the pudding was actually good. Silky in texture being not too soft nor firm, the coconut pudding was aromatic without too much sweetness. Not sure what the red bean sauce was for because we didn't really use it. Another one of their signature items is their Dessert Tofu. We decided on the black sesame version and it was also on point. Silky and not watery, the tofu was in a beautiful shade of light black. It was nutty and aromatic, but further amped by the side of brown sugar, simple syrup and black sesame sauce. 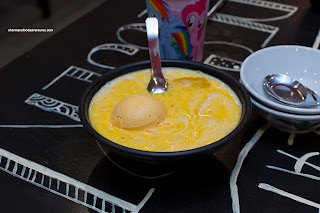 For no better reason that to try more items, we also added the Mango Trio (really a mango sago) with rice cake (little mochi bites). This was also on point and a delight to eat. The creamy, yet not too thick, "soup" was the right cool temperature with little pops of tapioca pearls, mango and mochi bites. The one scoop of mango ice cream added more sweetness and creaminess, but wasn't overwhelming. 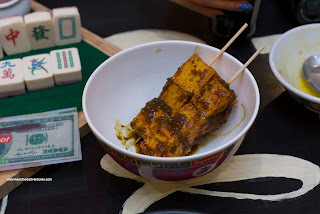 Lastly, we went for something savoury in the seemingly simple Curry Fish Tofu. Yes, the large squares of fried fish tofu was pretty standard, but the curry was what set this apart. Thick, a bit chunky and full-flavoured, the curry was spicy and impactful. Definitely a good compliment to the mango trio. 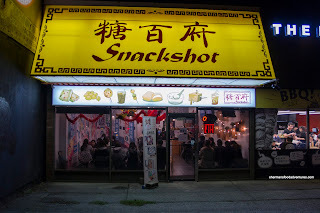 So the stuff at Snackshot is pretty gimmicky (including the drinks with a bottle in it that we didn't try), but overall execution is strong. Prices are a little high, but worth a try regardless. 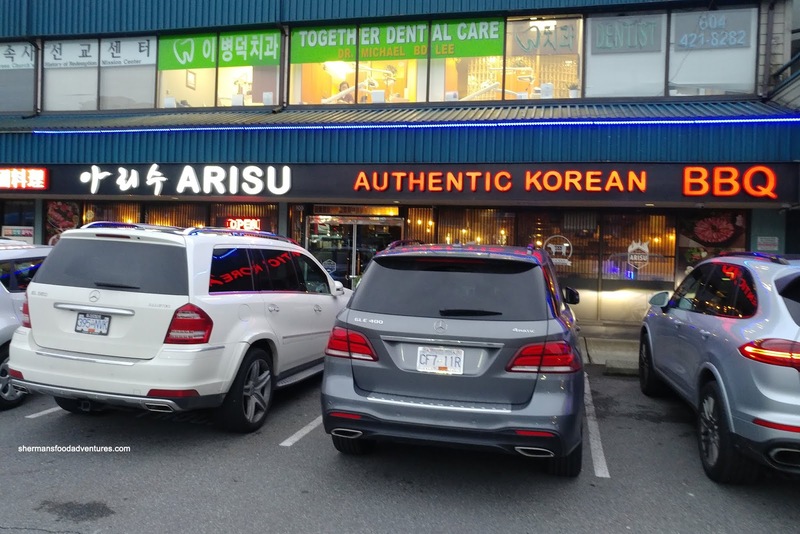 Last time I checked, there are over 600 Japanese restaurants in the Lower Mainland. Of those, there are many that exclusively serve ramen and some that are classified as izakayas. We have only a few that are authentically-Japanese owned and operated while even more rare are the ones that serve up Yoshoku cuisine. 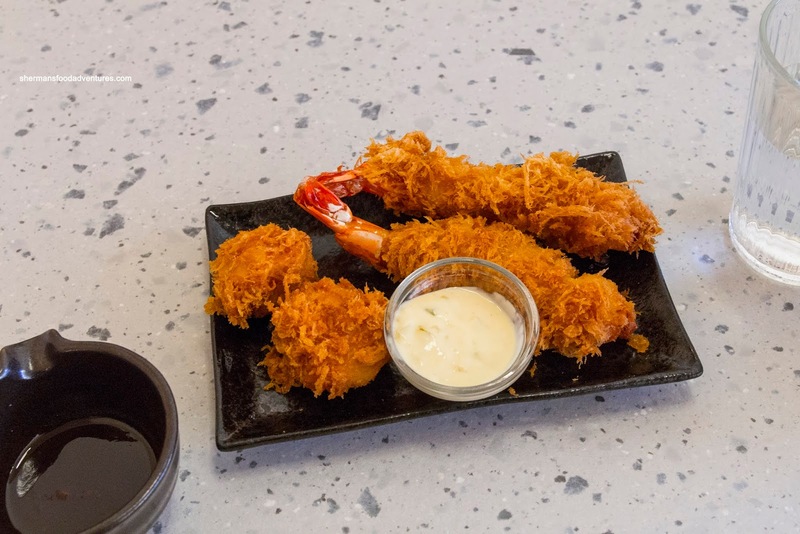 So in general, most of the Japanese restaurants we have in town serve the usual greatest hits that include sushi, sashimi, teriyaki and donburi. So it is truly surprising that we finally get Saku out on Robson Street that only does Tonkatsu. 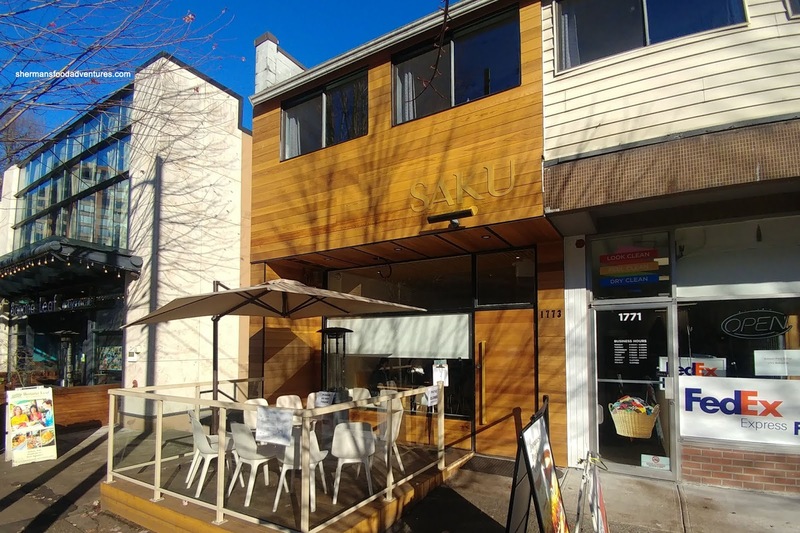 Yep, we have Saboten in Richmond, but really, Saku is the only true restaurant that dedicates itself to Tonkatsu. I ventured out there with the kids to see what the fuss was all about. We just missed the lineup by arriving at store opening for lunch. My son didn't stray far from the standard ordering the Hire Katsu Set featuring 2 deep fried pork fillets with a bowl of rice, cabbage, pickles, salt, sesame seeds and sauce. This was a substantial amount of meat for one person considering the fact that all the sides were unlimited too. 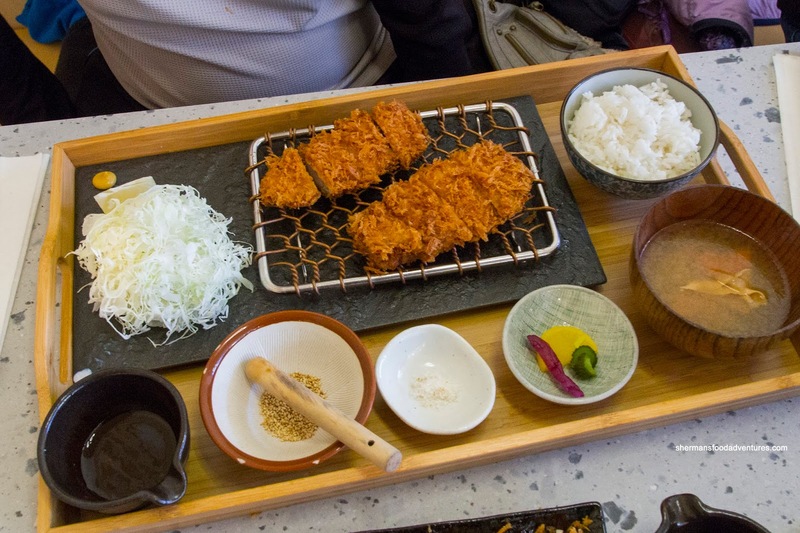 The cutlet was perfectly fried being golden brown with an airy and crispy exterior. Inside, it was light, tender and juicy. 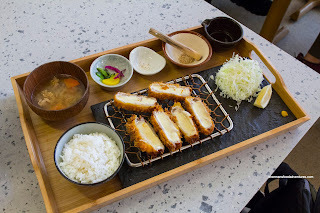 My daughter went for the Cheese Katsu Set with the same accompaniments. 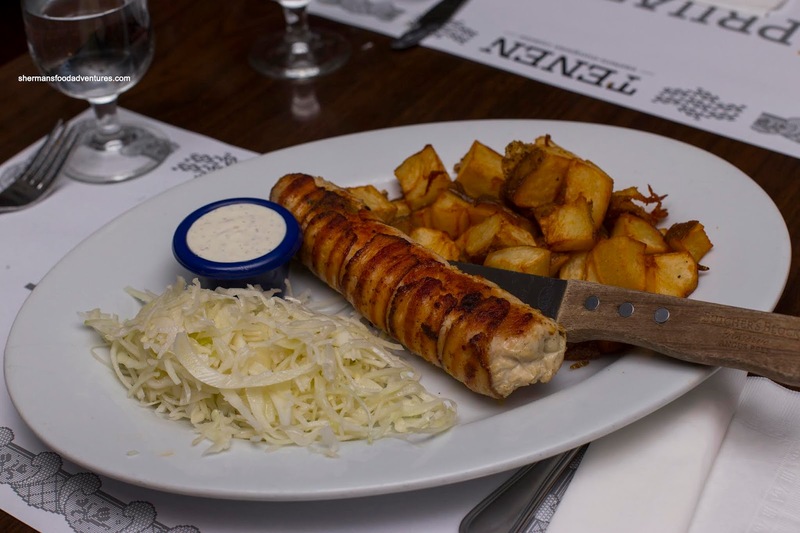 Now if you look at the picture, you will noticed that it was more about the cheese than the thin layer of pork surrounding it. Hence it ate heavy, yet was super cheesy and tasty. She loved grinding up the sesame seeds for full nutty flavour to go with the salt and tonkatsu sauce. For myself, I had the Curry Hire Set and although the amount of curry looked alarming, it was the right amount. 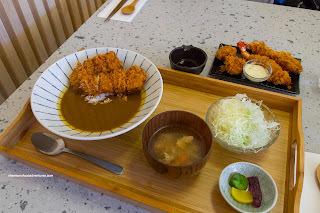 This way, I could dunk the perfectly fried juicy cutlet into the thick flavourful curry for full effect. It was a good balance of savoury and sweet with an impactful amount of rich curry. There wasn't too much rice and that suited me fine as I could've gotten more anyways. I loved how I could adjust the dressing on the side of cabbage as it was available on the table. Just because I was curious, I added 2 Jumbo Prawns and 2 Scallops as well. Also fried perfectly, these were crispy while still moist on the inside. The scallops were large, buttery and soft while the prawns were meaty with a firm snap. So all this food was indeed filling and tasty, but it wasn't cheap either. With that in mind, I still think it wasn't completely overpriced given the quality and execution. 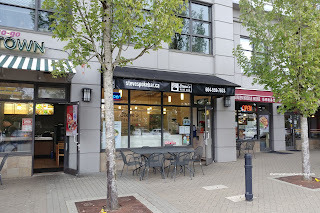 Also, it is located right on Robson Street. Worth a try. 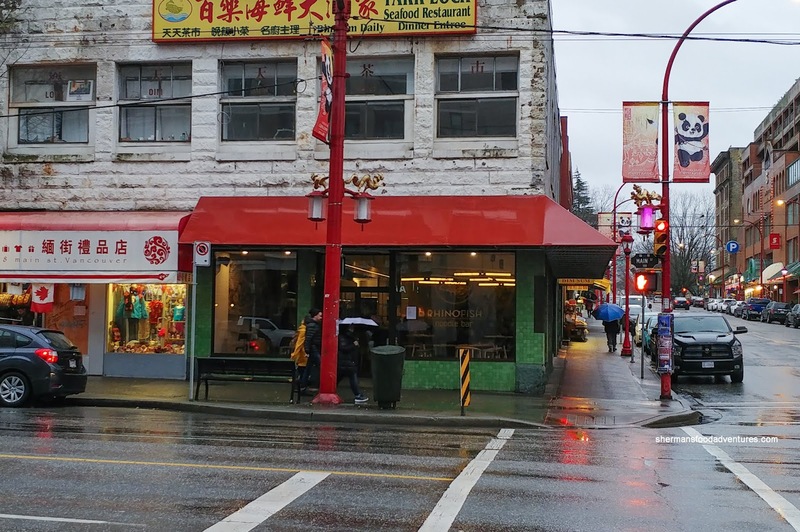 Usually, when one spots a restaurant featured on Groupon, there are a few assumptions made - either it is new and trying to get the word out or they are not doing very well. I'm sure there are other reasons too, but those are 2 of the most prevalent that I've seen. 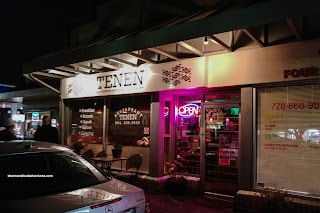 So when I saw the Groupon for Tenan Restaurant in South Burnaby, I was mildly interested. I just wasn't sure if it was worth a try. However, at a recent wedding, someone at my table raved about the place and that prompted me to buy the Groupon. I headed out with the family and kicked things off with the Traditional Meze Platter for 2. Served attractively on a wooden plate (like an actual tree trunk one), there was more than enough for 2 people. 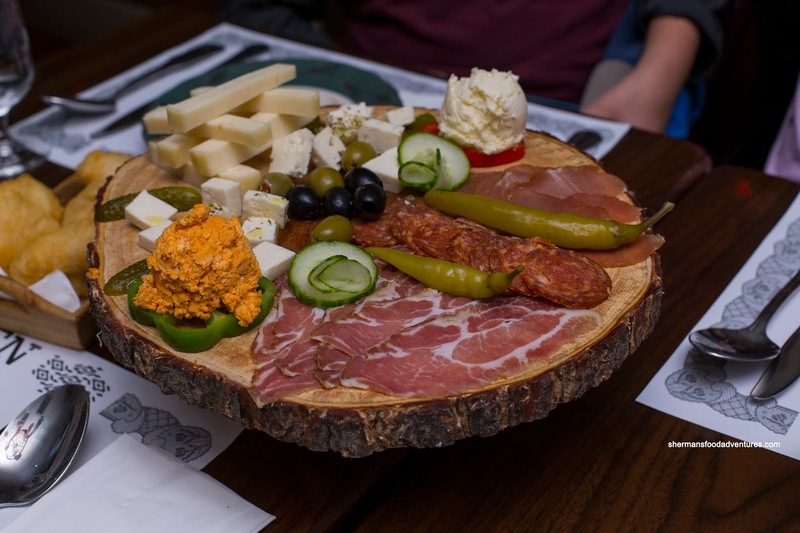 It included smoked pork loin, kulen, pork neck, katchkaval cheese, corn bread, ushtipci, kajmak and urnebes. The best part of this was the fry bread as it was fluffy and light. Eaten with the kajmak (cream cheese) and boom, it was all gone making us wanting for more. Can't believe this was only $11.95. 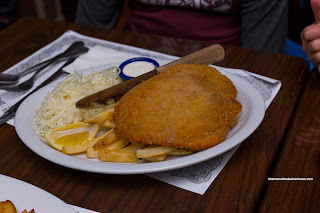 Onto our mains, my son had the Pork Schnitzel with fries and coleslaw. This gigantic hunk of pork was thick, yet at the same time, juicy and tender. It was fried up crispy while not being greasy. This was served with tartar sauce and lemon, where it was simple, but tasted great. Underneath, the ample amount of fries were hot and crispy. I can't imagine anyone finishing this and not feeling completely stuffed. He gave it a try but came up short, only finishing 3/4 of it. 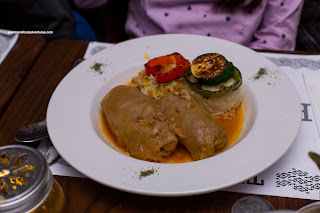 For my daughter, she had the Cabbage Rolls which were not the most attractive to look at. However, they ate well with a tender cabbage exterior that still had some texture. Inside, the pork filling was tender and mildly spiced. I personally would've liked to see more sauce though. Viv had one of their signature items being the Chicken Roulade stuffed with spinach and cheese while being wrapped with bacon. I cannot stress enough how perfect the bacon was cooked as it adhered tightly to the chicken and was super crispy (no flabby bacon here). This gave a salty smokiness to the otherwise mild-tasting chicken. It was on the drier side, but was still good due to the cheesy filling. 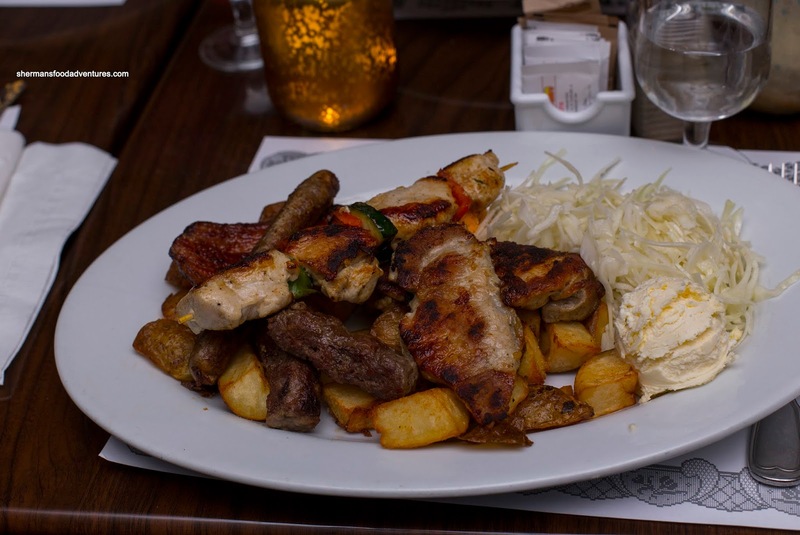 For myself, I had the Serbian Signature BBQ with chevapi, chicken shish kebab, pork cutlet, chicken thigh, thick cut bacon and sausage with fries, kajmak and coleslaw. Other than the pork cutlet and bacon, most of the other meats were rather dry. However, I'm not surprised as most Eastern European meats I've encountered are not exactly juicy. With that being said, I still enjoyed the plate as it was truly filling and hey, I love meat! 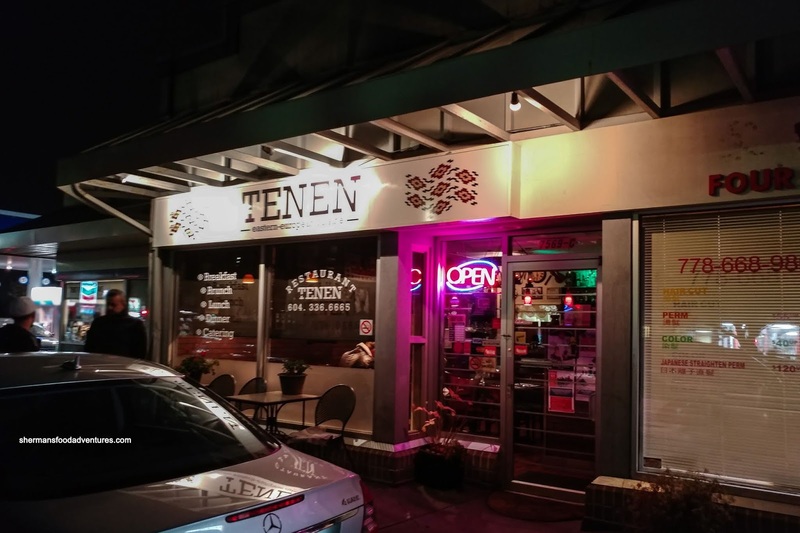 Now would I say the food was mind-blowing at Tenen? Well no, but it was well-made and a good value with great service. Let's just say I'll be back. Often, we see copy-cats quickly pounce on a popular trend in town. For instance, the poke craze is probably the best example where there have been so many opening up, it is almost impossible to keep track of them. 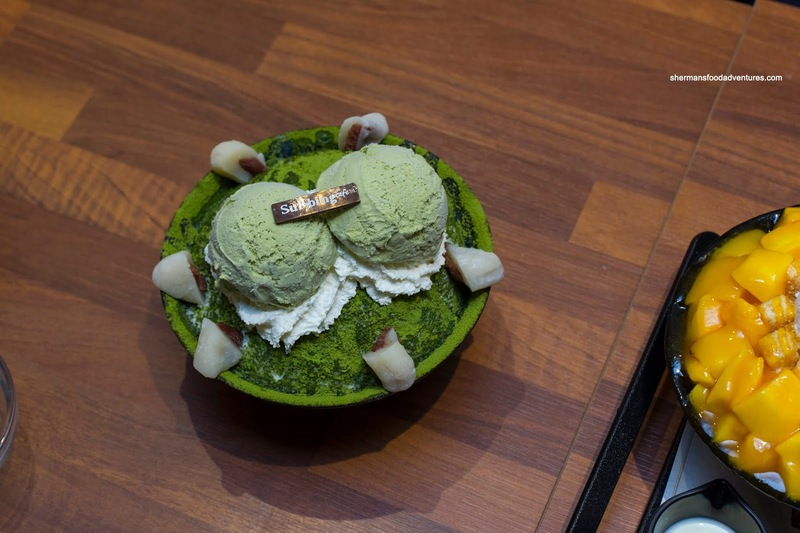 However, it seems that the bingsoo train has been a bit slow in arriving at the station. Snowy Village burst onto the scene and deserved all the kudos they received. Yet, the copy-cats were not as many as one would think, especially with the popularity of the dessert. Currently, my favourite is My Frosty out on Renfrew, but there is another one I haven't tried up until my recent visit to Arisu. 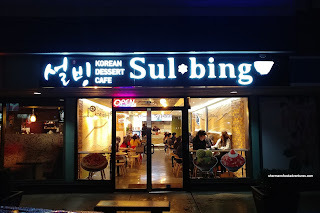 Located a few stores down, Sulbing was the perfect dessert after a filling Korean BBQ meal. As per usual, we got my favourite in the Mango Cheese Bingsoo and also Girl Smiley's favourite being the Green Tea. 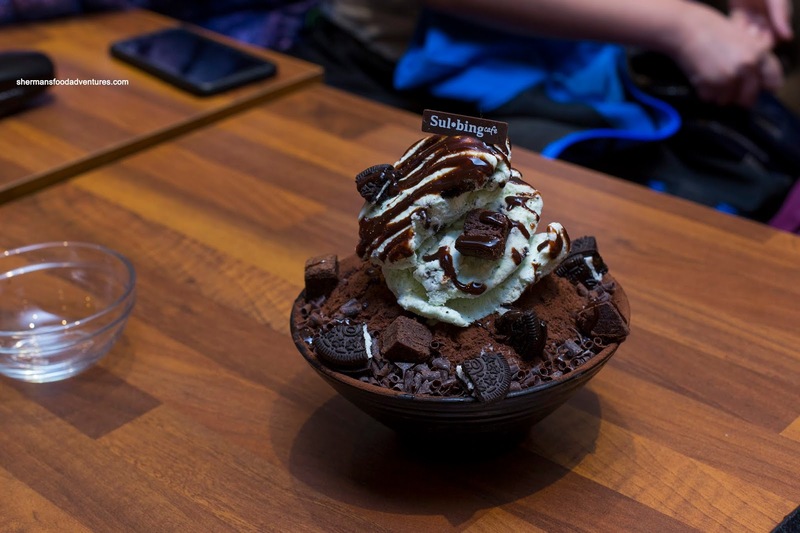 Similar to the current size at Jack Frost, the ones at Sulbing can be described as adequate. Personally, I'm not all that offended by the smaller sizes since it is pretty hard to finish them in general. I found the mango to be pretty tasty and sweet with fluffy semi-sweet snow underneath. Little nuggets of cheesecake surrounded the ice cream. Loved how they provided a side of condensed milk on the side to customize the sweetness. With 2 scoops on ice cream on top and bits of mochi with red bean on the side, the green tea was pretty decent. Again, the sweetness level was moderate, hence the green tea came through with a slight bitterness. Usually, I'm not a fan of red bean, but with the mochi, it was good. For something different, we got the Chocolate Mint featuring chocolate brownie bites, Oreo bits and mint ice cream. 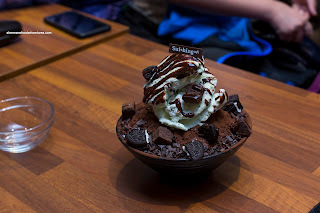 This was the sweetest bingsoo of the bunch due to the ingredients involved. Not one that I would necessarily order for myself, but the kiddies devoured it. Beyond the usual chocolate sugariness of the Oreos and brownies, the mint ice cream added a nice balance. 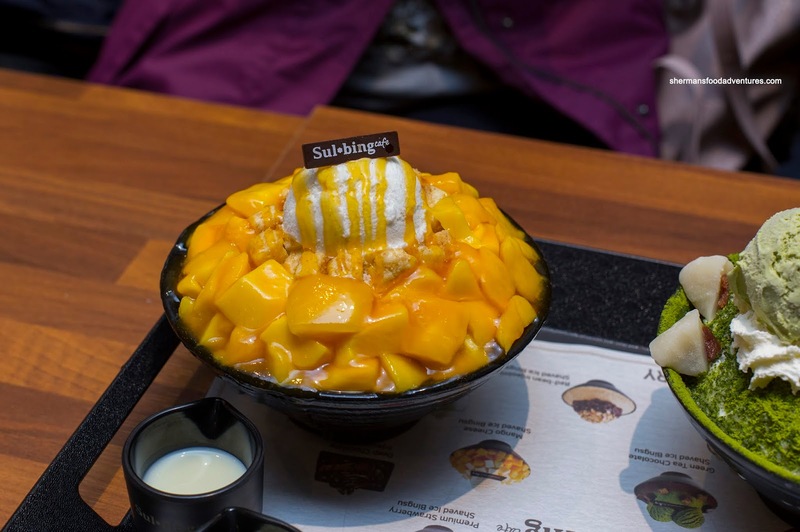 Overall, we were satisfied with the items we tried at Sulbing and wondered why there are so few bingsoo options along North Road (it's like K-Town after all). 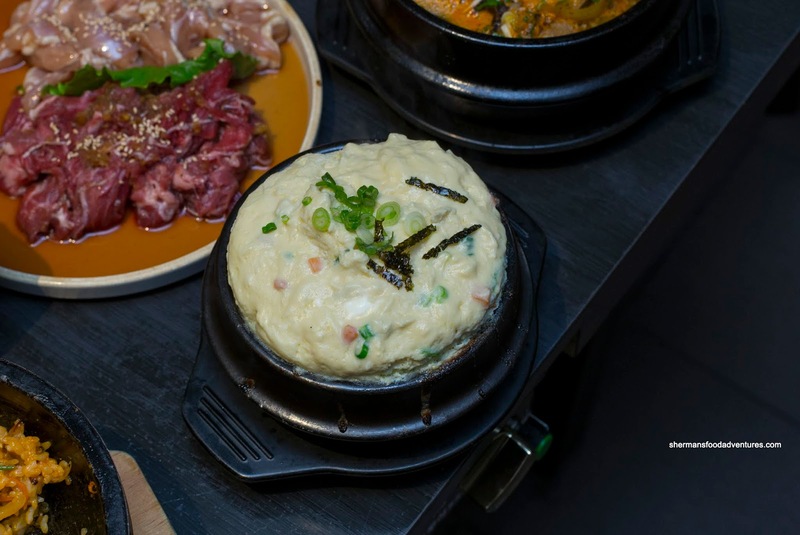 Let's get this out of the way first - eating at most Korean restaurants is a pricey proposition. Yes, I put "most" in there because making a blanket statement like that is neither accurate nor fair. 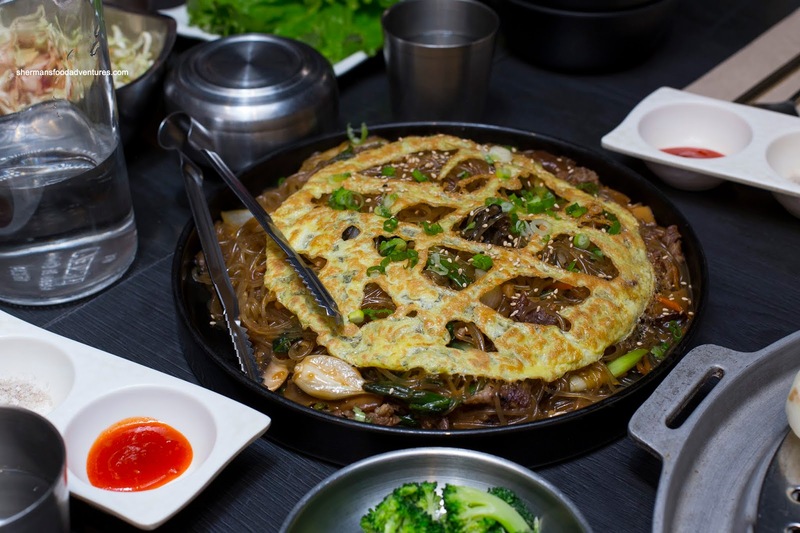 However, it is true that many Korean restaurants are not cheap where some prices are rather mind-boggling ($20 for a Japchae???). On the other hand, I can understand why Korean BBQs can be higher priced due to the abundance of meat provided (depending on quality) and also what is included (such as Banchan, soup and rice etc...). 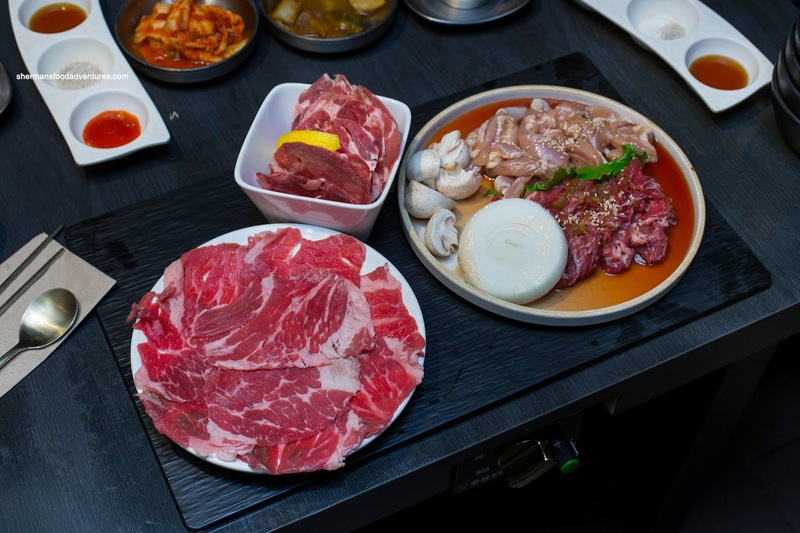 Now when we get a Korean BBQ that is both decent and well-priced, that is a winning formula in my books. 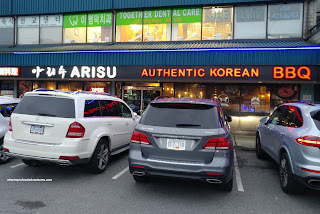 We headed over to Arisu Korean BBQ on North Road since this was the scoop on the place. We ended up doing 2 of the BBQ combos which included the usual Banchan, rice, romaine lettuce and such. Arisu Combo A consisted of sesame oil-marinated boneless kalbi short rib, marinated pork collar, pork jowl and bulgogi while Arisu Combo B featured sliced beef brisket, beef tongue, bulgogi and chicken bulgogi. Although raw meat on a platter never looks like "enough", believe me, it was enough. Naturally, the charred and caramelized short rib was a table favourite while the tender chicken was good too. The beef brisket was a bit dry and chewy while the beef tongue was surprisingly tender with a bite. 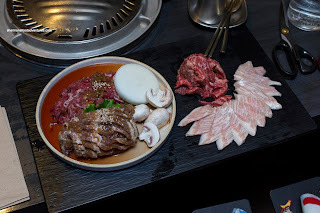 Sliced thin, the beef bulgogi was tender and charred up nicely (when we turned up the burner). Predictably, the pork jowl and collar were tender with a buttery bounciness. 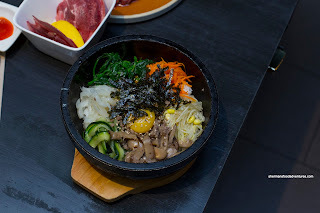 Ensuring that we wouldn't go hungry and to provide some variety, we also had the Japchae and Dolset Bibimbap. These were also quite good. Sure, the Japchae was at its usual expensive self at $16.95 (less expensive than some other places though), but at the very least, the portion size was large. Noodles were chewy, yet tender while mixed in with plenty of tender beef and crunchy veggies. I liked how it wasn't greasy nor was it over-seasoned (as in too sweet). As for the Bibimbap, the hot stone bowl wasn't hot enough to create a rice crust even though I had squished the rice onto the sides so that more surface area touched the stone. It might've had to do with the rice being on the wetter side as well. Despite this, it still ate well with a liberal squeeze of the gochujang. 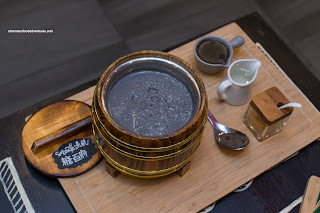 Our last 2 items were the Gamjatang and Steamed Egg in Clay Pot. As shown in the picture, the gamjatang arrived bubbling hot. 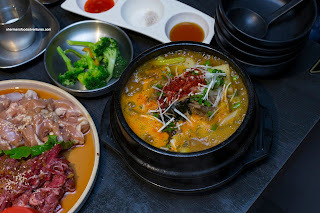 There was plenty of tender pork bones within while the broth itself was meaty and slightly spicy. 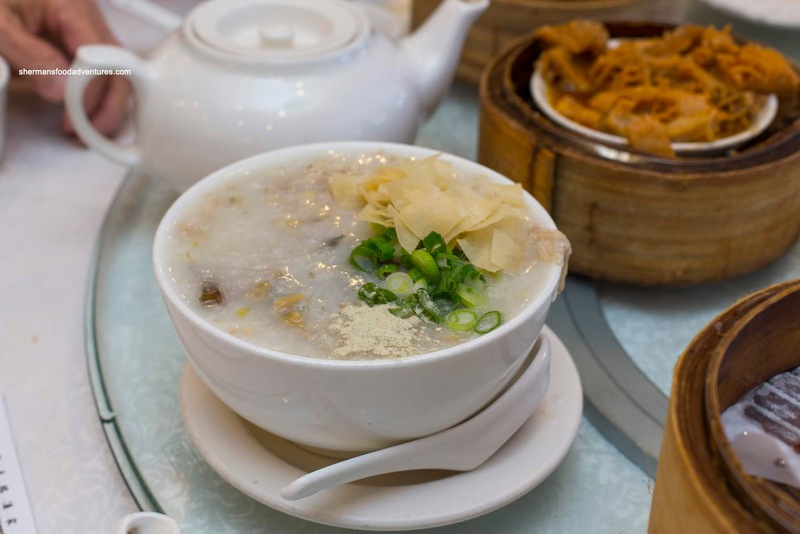 As excited we were about the steamed egg, it wasn't exactly what we were expecting. With other versions we've had, the egg has been usually silky, barely done (or bordering on not done) and in a deep shade of yellow/orange. This one was pretty pale and overdone. Either they messed this one up or if this is usually how it is prepared, I would highly suggest you skip it. Other than this, the rest of the meal was rather pleasant and reasonably-priced. We got attentive service and are looking to return soon.